As is the case across the country, there are parts of the Wakefield district where more people tend to be poorer, or less healthy, or more likely to be out of work. The Index of Multiple Deprivation (IMD) is calculated for every neighbourhood in England every three or four years, and it combines issues such as income, employment, education, crime and housing. At the district level Wakefield is the 65th most deprived district in England (out of 326 districts), a small change from 2010, when Wakefield was 67th most deprived. The IMD 2015 shows that 47,400 people in the district are living in neighbourhoods amongst the top-10% most deprived in England. This is 14.4% of the district’s population, similar to the position in 2007 (14.6%). The geography of multiple deprivation is shown below. The district’s deprivation profile is shaped by high levels of education and skills deprivation, and relative to England the situation remained unchanged from 2010. Income and health deprivation are also prominent and both worsened relative to England between 2010 and 2015, but crime and living environment deprivation both improved. Analysis of the IMD 2015 shows that deprivation relative to elsewhere in England has stayed the same for 78% of neighbourhoods. For 16% of neighbourhoods the relative deprivation has become worse and 6% of neighbourhoods have improved. 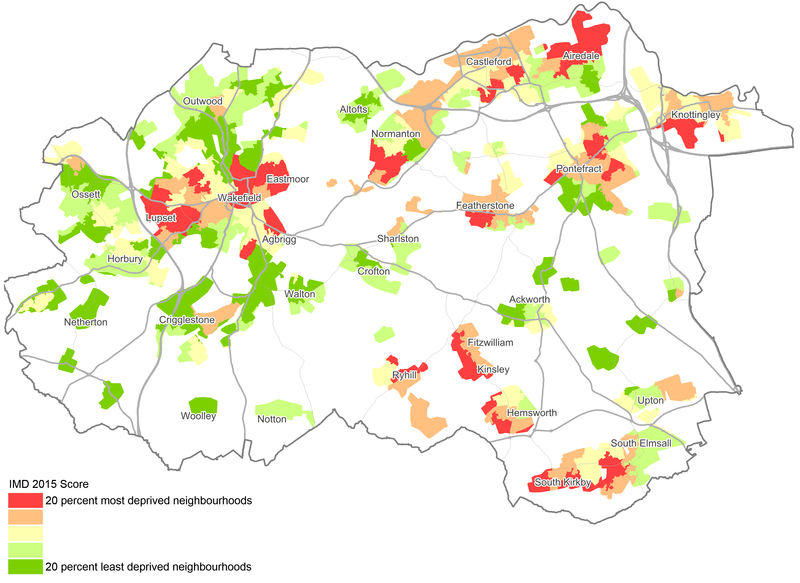 Of the neighbourhoods that have seen improvement, all had low levels of deprivation to start with. The Income Deprivation Affecting Children Index (IDACI) measures the proportion of all children aged 0 to 15 living in income deprived families. It is a subset of the Income Deprivation Domain which measures the proportion of the population in an area experiencing deprivation relating to low income. The definition of low income used includes both those people that are out-of-work, and those that are in work but who have low earnings (and who satisfy the respective means tests). IDACI 2015 ranks Wakefield as the 84th most deprived local authority in England (out of 326 areas). 4,865 children aged 0-15 years in Wakefield are estimated as living in neighbourhoods that are amongst the top 10% most deprived in England, this is 13% of the district’s population in this age group. The Income Deprivation Affecting Older People Index (IDAOPI) measures the proportion of all those aged 60 or over who experience income deprivation. It is a subset of the Income Deprivation Domain which measures the proportion of the population in an area experiencing deprivation relating to low income. The definition of low income used includes both those people that are out-of-work, and those that are in work but who have low earnings (and who satisfy the respective means tests). IDAOPI 2015 ranks Wakefield as the 104th most deprived local authority in England (out of 326 areas). 2,479 older people, aged 60 years and over in Wakefield are estimated as living in neighbourhoods that are amongst the top 10% most deprived in England, this is 3% of the district’s population in this age group. The latest annual data show fuel poverty is continuing to increase gradually (see chart below). In 2016, 16,100 households in the district (11.2%) had required fuel costs that were above average and which, if spent, would leave the household with an income below the official poverty line. Across the region the rate is higher, at 12.1%.